Most office jobs nowadays involve a lot of sitting down and working on a computer all day. This promotes an unhealthy sedentary lifestyle, which is only aggravated by….your chair. Yes, the very piece of office furniture you’re sitting on is secretly plotting to make your back retire way earlier than expected. Since we end up spending so much time at work, it’s more important than ever for us to focus on making our working setup ergonomic. And since a chair a huge part of it, it’s necessary to get your a good ergonomic chair that will help you be more productive (and less in pain). We decided to put this guide together to give you more information about the most comfortable office chairs under $200 and help you find to make the right decision. Still confused about which ergonomic office chair is best for you? 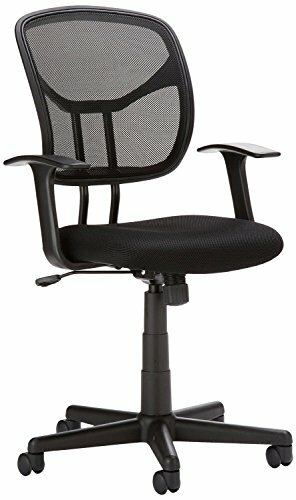 Let me help by providing detailed reviews on the best ergonomic office chair that you can find in the marker and costs you less than $200. These reviews will definitely help you gain awareness and understanding about the best features, pros, and cons of an ergonomic office chair. If you’re considering replacing your regular office chair with an ergonomic office chair, I have a list of top 10 ergonomic office chairs to consider. Below is the table that shows all the ergonomic office chairs under $200 covered in this review. Now let’s have a look at the detailed reviews of each of the ergonomci chair covered in this article. This ergonomic office chair from Hon is extremely high-quality. You will understand why it’s one of the expensive ones on this list as soon as you sit on it. The first thing you will notice is the gorgeous leather seat, which looks and definitely feels premium. It will feel stiff during the first few days, but you will just have to break it in. It measures 24 x 24 x 14.5 inches and weighs 29.3 pounds. 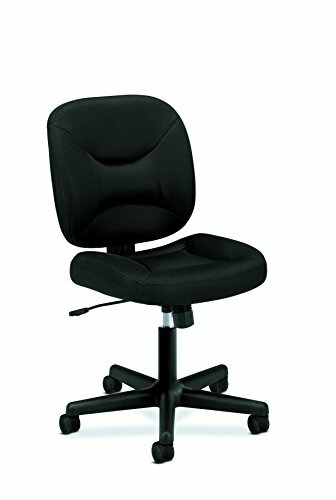 As you can notice in the image above, this ergonomic office chair comes without any armrest. Now this is not necessarily a bad thing, and it you absolutely need armrests, you can buy these separately. Synchro-tilt, which allows the seat and the backrest to recline at different rates. It suits a wide range of heights and leg lengths. The chair is highly flexible and adaptable. The synchro-tilt feature is great if you have back pains. It doesn’t come with an armrest, but can be bought separately. 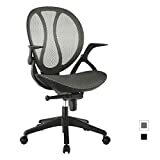 Measuring 29.13 x 25.59 x 41.34 to 45.08 inches (LxWxH), this ergonomic office chair from Amazon can support a maximum weight capacity of 250 pounds, which is not bad at all for its size and bulk. The seat, backrest, and armrests are padded and covered in bonded leather and PVC. Again, bonded leather is not the most durable material and should not even be used for something as frequently used as an office chair. But the PVC material (maybe) was added in to make up for what the leather lacks in terms of durability. The backrest and seat are very comfortable to use. It comes with heavy-duty casters. The PVC material might look a bit low-grade (although it’s not). Weighing 23.7 pounds and measuring 31.9 x 23.8 x 14.4 inches, the Lorell Executive high-back chair has that sleek look that more than deserves to be called “executive”. 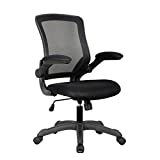 What sets it apart, though, is that contrary to many other ergonomic chair models out there, this product does not have a very pronounced curve at the lower back, which is something some people complain about in other chairs. It looks and feels premium for the price. The backrest offers full support. Tall people have reported some issues with it. Although fairly light (weighs 28.8 pounds. ), this ergonomic office chair from Langria can hold up to 308.6 pounds of evenly distributed weight, thanks to its tough high-grade materials. The nice thing about this office chair’s mesh backrest is that although it is not padded, it feels just like it is. It is that comfortable. Also, a mesh backrest means no icky sweat and body heat getting trapped in padding and causing the chair to stink! The design of the chair is ideal for people with chronic back pain. Its arms can be easily moved out of the way. The mesh backrest is incredibly comfortable. The first thing you will notice about this ergonomic office chair from Essentials by OFM is its appearance. Despite being priced under $100, it definitely looks classy and luxurious. 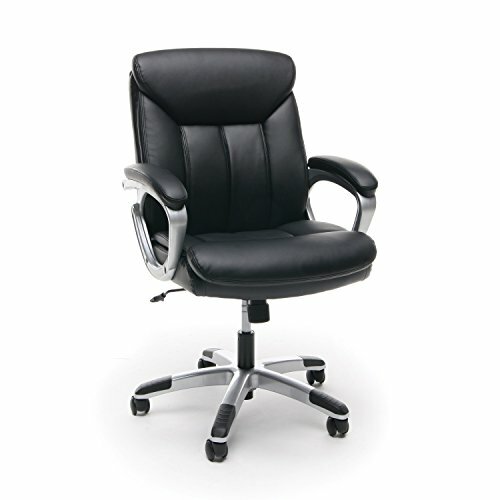 Its features include recessed lumbar support, tilt tension adjustment with a locking mechanism, 360-degree swivel, and more. The segmentation of the padding provides durability and stability. 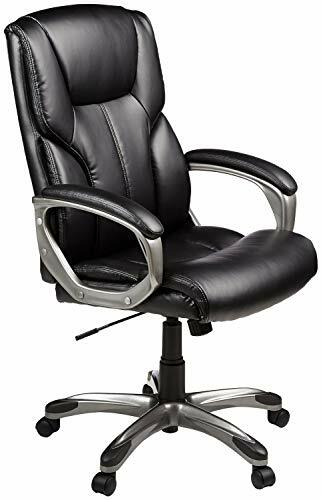 What the manufacturer really worked hard on in the case of this task office chair are back support, reclining mechanism, armrest design, and height adjustment. Obviously, the flip-up arms are the centerpiece. They are generously padded and are easily and conveniently flipped up right out of the way. The height adjustment (maximum 21 inches) is done through its pneumatic mechanism, and the reclining back can be manipulated through the tilt tension knob below the seat. It’s nice that the arms can be moved away. We really can’t stress the benefit of having mesh backrests enough. The weight capacity is only 220 pounds. Without any armrest to busy themselves with, Hon put a lot of thought into the backrest and the seat of the HVL210. There is a center-tilt control mechanism that is very easy to use and comes with an upright locking system and adjustable tension. You may like the double-layered and contoured cushions. They provide a lot of support and comfort without compromising the other. The “waterfall” design of the seat’s front edge is nice because it tapers off and therefore does not feel rigid against the back of your thighs. Its “waterfall” front seat edge is a nice touch. The elegantly named Articulate ergonomic office chair is a little heavier than many chairs of its kind, weighing about 36 pounds. Measuring 27.5 x 26 x 41.5 inches, it apparently is also a little bigger. It’s a good thing it puts that extra heft to good use. Some of the things we like about Modway’s ergonomic office chair is that it comes with an adjustable backrest and armrests and has a pneumatic height adjustment mechanism. 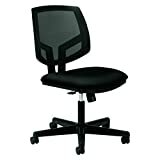 There is also passive lumbar support, tilt tension adjustment, tilt locking, and adjustable seat depth. The mesh backrest is easy to clean. checkIts vinyl-covered sponge seat is durable and easy to maintain. The iron legs are solidly built. This ergonomic office chair from Boss Office Products is unique because it comes in different colors. Black remains the unspoken color of the corporate workplace but that does not mean you can’t express your unique personality through a striking red office chair or a pristine white one! One more thing I like about this is the optional foot ring. It just gives you more options in terms of how to relax and make yourself comfortable in-between long periods of typing. This ergonomic office chair from Amazon measures 24.02 x 24.02 x 34.84 to 38.58 inches (DxWxH) and can support up to 225 pounds of evenly distributed weight. The seat, armrests, and the backrest are all covered in bonded leather. It all looks very classy at first, but bonded leather is known to be a cheap kind of leather that tends to wear and tear easily. This chair is very affordable, though, so you can’t really complain about the material. The PVC material looks a bit low-grade. Ideally, you should have known the moment you knew for sure that you would be spending eight hours a day sitting down that you would need to have an ergonomic office chair. However, it is easy to put things like this off when you have so much to do with so little time. Also, not all employers are quick to respond when their employees express their desire to not damage their spines in a hundred different places while making presentations and spreadsheets. Okay, that’s too much, but you get the point. If you are hearing about the issue of ergonomics just now, it’s time to do a quick check of your office chair. Here are the signs that you need to give your body a break simply by switching chairs. Ordinary chairs force your spine into an upright position, thereby putting the pelvis off balance. The combination of the weight of your torso and the upward pressure from your seat turns your pelvis into a kind of lever that distorts your spine forward. Consequently, your ligaments are strained until they can’t protect your intervertebral discs anymore, thus leading to disc compression. Chronic back pain or lumbago, sudden acute pain, and prolapsed or slipped discs are the most common back issues caused by non-ergonomic office chairs. Most regular office chairs make it inevitable for you to slouch or hunch your shoulders while working. You get so preoccupied most of the time that you don’t even notice what a terrible position you’re in until you feel pain already. Neck pain can result from a number of factors. It can be the placement of your monitor, the height of your desk, your posture, your chair, or combinations of those. The general rule is that your eyes should be level with the top third of your screen when you’re sitting upright. When you sit too lowly relative to your desk, the “lifting” muscles in your shoulders are forced to contract for a sustained period because you constantly have to reach up for the mouse. When you sit in such a way that you have to constantly reach forward or move to the side, you put unnecessary strain on your neck and shoulders. A non-ergonomic office chair can also lead to a bad head posture, whose impact can be felt in the neck, shoulders, and all the way down to your arms and hands. According to WebMD, when blood is not circulated as it should through your legs, “blood collects in your legs, and pressure builds up. The veins become weak, large, and twisted.” You may often find yourself sitting with your feet either dangling or tucked under your chair. These positions affect blood flow, thereby leading to swelling of the veins. Leg pain commonly results from sitting for extended periods of time on a chair that is not the right height. Ideally, your legs should be bent at a 90-degree angle, with feet flat on the floor and thighs parallel to the ground. Sitting positions other than these can cause a multitude of issues over time. Rigid seats are the ultimate enemies of your hips. The important thing is that your hips do not get stiff from being restricted in one position for long periods of time. Hip issues can get serious (and not to mention, expensive) if not attended to right away. Carpal Tunnel can result from various factors such as constant use of a mouse, keeping your hand in a twisted position, working long hours without breaks. A bad office chair with rigid armrests can cause or aggravate carpal tunnel syndrome. They cause your shoulders to become tense and prevent your forearms from being parallel to the ground. As a result, you are forced to extend your wrists or tense them while typing away. One of the best ways to relieve carpal tunnel pain is to switch to an ergonomic mouse and start using ergonomic accessories such as a mouse pad or gel wrist rest. Your monitor is not the only thing that is hurting your eyes. Your posture and the height of your chair are just as important. Your monitor should be 20 to 24 inches away from your eyes, and its center should be positioned about 15 degrees below your eyes for maximum comfort. At first glance, you may not notice any difference between a regular or traditional office chair and an ergonomic office chair. They are very similar in appearance and shape. Even the adjustable knobs and levers under the seat and the bases look a lot like each other sometimes. A regular office chair is something you simply sit on, period. Its only benefit is that you do not have to stand or sit on the floor while working. Other than that, there are no other advantages to sitting on a regular office chair. It is even detrimental to your health, especially if you have an office job that requires sitting for several hours on end. Meanwhile, ergonomic office chairs do way more than simply keep you from having to work on your office carpet. They go the extra mile by providing sufficient support for your body, especially the parts that really take a beating in your day-to-day office life. How does an ergonomic office chair fulfill that promise? Adjustability. Too tall? Adjust the chair’s height. Short thighs? Slide the seat backward. Certain parts of your back hurting? 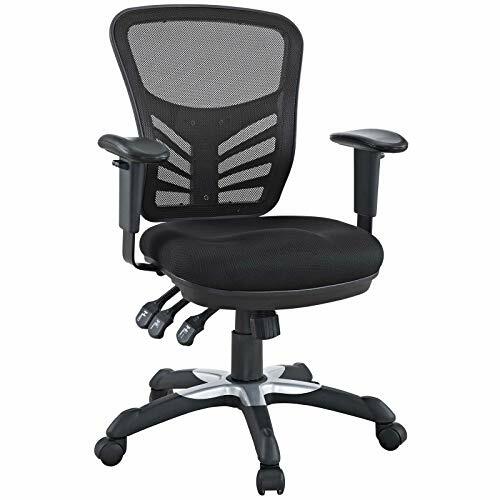 Adjust the backrest so that your back is supported nicely even as you sit all day. Carpal tunnel? Yes, that is covered as well. 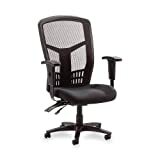 We mentioned earlier that there are two main differences between a regular office chair and an ergonomic office chair. The second one is..
Needless to say, ergonomic office chairs are more expensive than regular ones. It makes sense, considering the amount of thought, research, and effort that goes into manufacturing them. When you design a regular office chair, you focus on how to make the chair sturdy and durable enough to hold a human’s weight every day without compromising comfort. However, when you design an ergonomic office chair, you have to apply a lot more science and research and development. Moreover, ergonomic office chairs generally have more individual parts than regular office chairs (highly adjustable, remember?). So it is only natural for them to cost more. Headrests are not required for ergonomic office chairs, but you can find this feature in many premium chair models. A good headrest should be just as comfortable when it is upright as when it is a little reclined. To reduce stress and prevent fatigue in the legs and knees, the height of your seat should be adjustable such that your feet are able to lay flat on the ground or on a footrest. When you’re working, your forearms, thighs, desktop, seat, and the ground should all be parallel to one another. If your seat is too high, the area behind your knees will suffer from too much strain. The overall blood circulation in your legs will also be affected. If your seat is too low, the high positioning of your knees will cause your weight and the pressure to shift to your sitting bones. Chairs with independently adjustable lumbar support are your best options. If you can’t find or have such a model, you should opt for a chair whose back height is adjustable enough for the lumbar support to be placed in the right position. 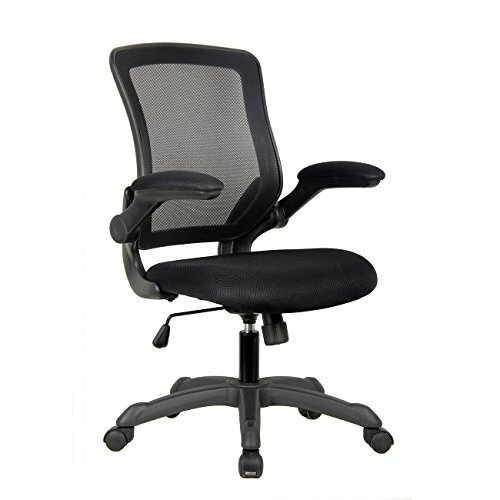 Sufficient lumbar support gives you plenty of benefits: improved comfort, focus, energy, and oxygen and blood flow. 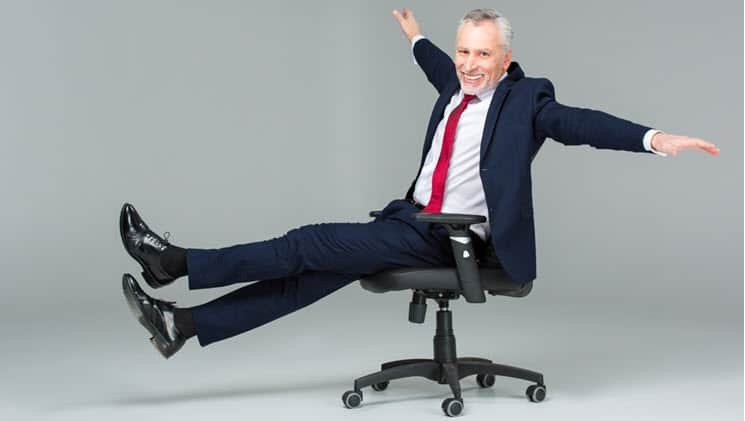 Ergonomic office chairs allow you to “slide” the seat forward and back so that you get enough clearance between the back of your knees and the edge of the seat. This helps reduce fatigue and improves blood flow. If your seat is too long, the back of your knees will be strained and you may not be able to take full advantage of your seat’s backrest. The general rule on this is that you should be able to fit four fingers between the back of your knees and the edge of your seat. It is not a requirement, but a five-spoke base with casters provides just the right amount of stability and support for the user. 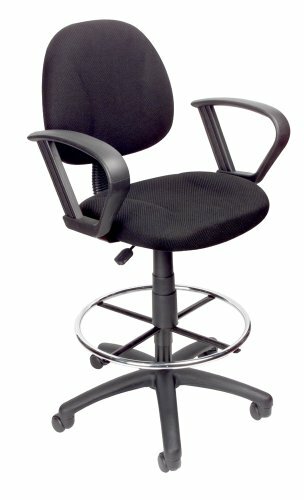 And since we just mentioned casters, let us stress the importance of high-quality casters in ergonomic office chairs. Poor-quality ones break easily and quickly. Aside from the obvious disadvantages of impaired balance and movement, bad casters are downright irritating and annoying to use. It is not enough that the chair itself can be lowered or raised. The backrest should be independently adjustable for height as well. This is closely related to the lumbar support feature that we mentioned earlier. By raising or lowering the backrest, you get to decide how the contours fit against your back. Good ergonomic office chairs have height-adjustable armrests. In addition to that, some models allow you to adjust the width of the arms or pivot them to where they can best support your arms. You should be able to work comfortably without having to hunch your shoulders. When adjusting your seat’s armrests, remember that your arms should be parallel to your desk. Although relatively less popular than other ergonomic chair features, adjustable tilt tension is one of the most important features you want on your chair. Certain models have a knob you can use to adjust the tilt (or the “rocking”) of your chair. This simply refers to “locking” the back of your chair versus leaving it unlocked so you can rock back and forth anytime. You may want to look for this feature because no matter how comfortable ergonomic office chairs are inherent, you still want a different kind of range of movement every now and then. It helps you relax and breaks the sedentary and monotonous pattern of your movements at work. The rule is that you should be able to reach your keyboard or desktop without straining your arms, shoulders, or eyes. Reclining at the ideal angle helps you minimize pressure on your spine, hips, and glutes. We hope that this article somehow helped you realize the benefits of investing in an ergonomic office chair. What you need to do now is to go over that list one more time, place an order for your chair of choice, and make up for all the wrong you’ve done your spine (and neck, wrists, legs, and so on!) all these years by throwing your old, badly designed office chair and replacing it with your new one.